It certainly has been a busy 5 days in the life of Bullet. 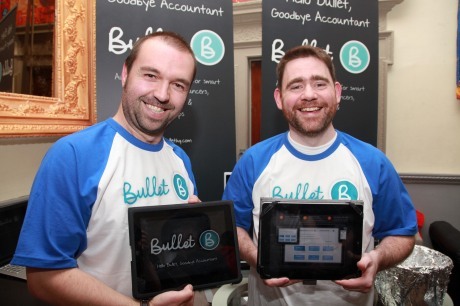 We were Sunday Business Post Startup of the Day, shortlisted for 2 National Startup Awards, and we won the people’s choice award at Dublin Beta. All in all, it was a good week in the crazy roller coaster that is a startup business. Myself and Pete have been genuinely surprised to the great reaction we’ve been getting from people. In this day and age of high tech social apps and billion dollar Instagrams, it’s good to know that humble accounting software is still solving real problems for people (namely reducing costs and stress!). Dublin Beta was a fantastic event. There were lots of other great startups there, and the place was buzzing with positive energy. I was definitely worried about demoing/pitching our product to lots of people, since I’m not a natural salesman, but it was great fun and I met lots of interesting people with their own great startups too. 45 Sound helps bands & artists tell their live music stories by making fan-shot concert videos sound great. Their technology replaces the (usually poor) audio of fan video uploads with high quality live audio provided by the band. BOSS Metrics is a digital & social media marketing management platform for SMEs which helps them report, analyse and plan like experts. Our innovative cloud based system turns raw digital marketing data into customised multi-site scorecards and action plans. Converser provides an easy, affordable way for mobile app publishers and developers to deliver two-way customer communications right inside their mobile apps. Get feedback, ask questions, create polls and offers all from one place. docu.ie is an all-in-one collaborative suite for small to medium sized businesses. The idea of docu.ie is to allow business to dramatically reduce their costs by moving all their time and cost consuming activities to the cloud. Hubb.it is the Online Community for attendees and organisers of Independent Events, like Festivals and Conferences, which have a focus on Arts, Music and Digital. GroupDocs is an easy to use service for sharing and working with documents. Think GoogleDocs meets RightSignature meets Crocodoc meets ContractExpress and you’ll get the idea. At My Type Of People they use your social interests to find like minded people so you can further enhance your purchasing decisions and also get tips and advice with people who you know enjoy similar things to you. Popdeem measures the hype you create online. Complete challenges to earn rewards for engaging with your friends on Facebook. Soundwave tracks what songs are playing in realtime by location as they are played around the globe. This offers users the ability to engage with hyperlocal music charts showing what songs are being played and where (their office, gym, current location, in Times Square, in Camden Street or their hometown for example). Trackalyse track, analyse and compare Facebook fan pages. Seeing your competitors growth, engagement rates and underlying most effective content in terms of post content and timing is invaluable information to increase your own engagement levels and fan growth — like a compete.com for Facebook pages.